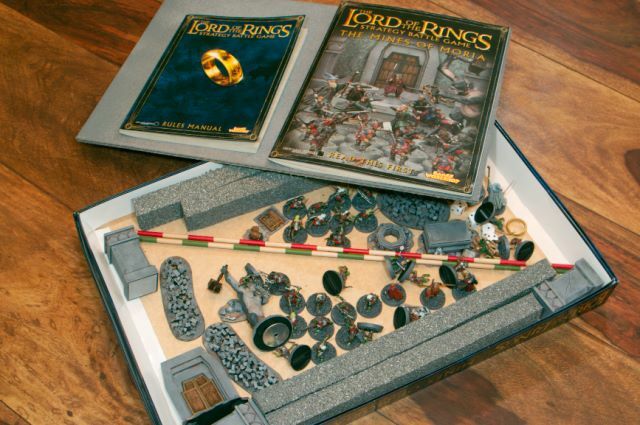 This article describes playing a game of the Lord of the Rings Mines of Moria from Games Workshop.I describe how to paint the figures inPainting the Lord of the Rings Mines of Moria Game,but this article recounts the first scenario of the game. 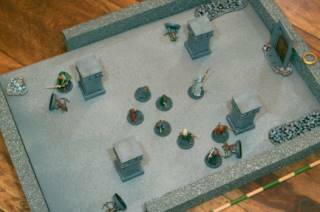 Here is the starting setup of the game.The Fellowship of nine is on the left. The exit door is on the right.In the middle of the room are 4 pillars with goblin bowmen behind each one.Some rough going rubble (halving movement) has been placed in the corners of the room. To win the Fellowship must exit the board with no casualties.The evil forces win by killing one of the Fellowship.True to the theme of the book, but kind of an all-or-nothing proposition. 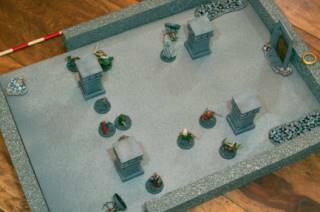 Overview of turn 1 - goblins attack! Here is turn 1. The good forces have the initiative as symbolized by placinga gold ring by the good side player.Hmm, something strikes me wrong about passing the ring between the good and evil sides. 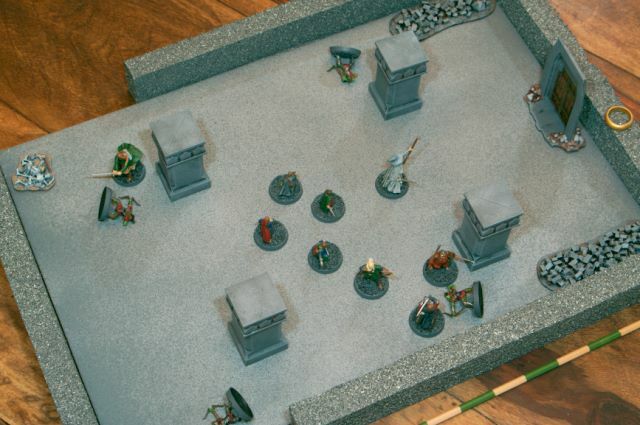 Boromir and Aragorn have charged into the first pair of goblins on the left.Once a figure charges into base-to-base contact, the otherside may no longer move.In a strange set of hand-to-hand combat dice rolls, both Bormir and Aragorn's 3 dice lose against the1 die of the goblins. The goblins push the good fighters back, but with no wounds. Gandalf, Gimli, and Legolas have charged ahead to their full movement.Since they have many wounds, they are in little danger of dying, unlike the hobbits whocan die with one lucky shot.The goblins move half a move in order to fire their bows.The goblins, needing a 5 or 6, miss hitting the Fellowship figures. In the next turn, the evil player wins initiative, thus moving and firing first.Gandalf charges the upper right goblin, locking him into hand-to-hand fighting.Gimli and Legolas move towards, but cannot reach the lower right goblin.The goblin and Legolas trade arrows, but both miss! In the mean time, Borormir at the lower left hits and kills his enemy.Strangely, Aragorn at the upper left hits and pushes back but does not wound his enemy.The hobbits advance cautiously in between the pillars. 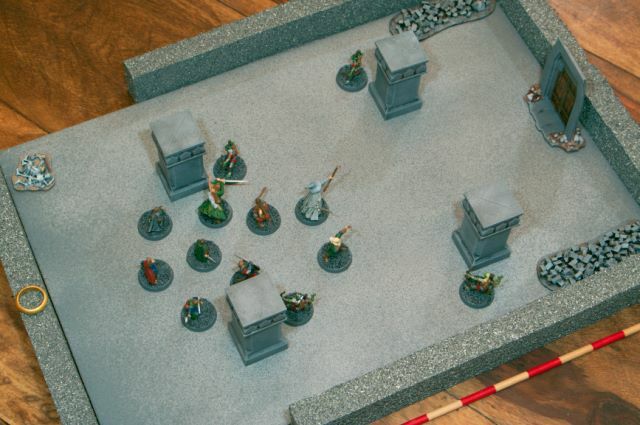 These game rules have interesting and fast skirmish mechanics.Each turn, there is a simple 1D6 for initiative.Both sides move all figures (in initiative order), then both shoot all missle combat (in initiative order),then both side fight hand-to-hand (simultaneous).The hand-to-hand combat is a dice-off followed by a roll on the wound table.Most miniature gamers will commit the wound table to memory, but I am sure I will need a chart.The winner pushes the loser back. Final turn.Gimli and Legolas engage their goblin.Gamdalf and the hobbits advance forward with Boromir guarding the rear.In hand-to-hand combat the good side kill off the remaining two goblins.Good is victorious here, but what awaits in the rooms ahead? The ring is safe for now.My game was lucky for the Fellowship, butother gameshave not gone so well.Cue the music. Frodo lives.Perhaps Gimli will see his roaring fires and fresh meat off the bone. 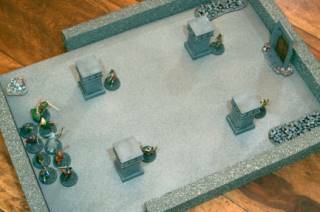 I hope you enjoyed reading about playingGames Workshop's Mines of Moria strategy board game.More miniatures-related articles are atDan Becker's Miniatures and Models site.Also there is a Mines of Moria painting articleon painting the miniatures.Thanks for stopping by and reading about my miniatures. Last modified: Thursday, 09-Jun-2011 12:51:51 MST.